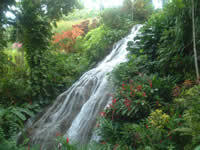 Experience the natural pristine beauty of Jamaica's Shaw Park Botanical Gardens and Waterfalls. Situated high on a hilltop overlooking the azure waters of the Caribbean Sea, the Gardens embrace 25 acres of tropical splendor. The Shaw Park property, consisting of approximately 600 acres was named after John Shaw, a prominent St. Ann resident, who died in 1821. The property was originally used for the production of sugar cane, but switched to oranges for export to New Orleans in 1892. Shaw Park Estate was purchased by Sir John McKenzie Pringle in 1905 and the estate was passed to his daughter Flora in 1923. The Shaw Park Great House was transformed into the original location of the Shaw Park Hotel, which was a very exclusive resort catering to the wealthy and titled. In 1940 the hotel boasted 40 rooms. The entire Shaw Park Gardens and hotel property was selfcontained, with its own ice factory and hydroelectric station. Flora McKenzie Pringle Stuart established the gardens and through her magic touch, Shaw Park Gardens and Waterfalls remain one of the finest botanical gardens in the world. Visit the stunning gardens and view hundreds of species of flowers, trees and plants. Relax beside the rushing waterfall and bask in the sun next to our natural spring pool. At over five hundred feet above sea level, Shaw Park Botanical Garden offers spectacular views of the Jamaican landscape while preserving the flora and fauna of this unique tropical nation. Gift shop and bar on site.